I believe that there are some alternative answers to Sundberg’s quest, and that those are found a) partly in main political parties of the Swedish establishment, and b) partly in the economic-military establishment; c) also the assisting role played by the Swedish state-owned media and MSM monopolies is paramount. I have done some background research on those items, and which I have published in Professors blogg. Examples, respectively: on a) the analysis Swedish/U.S. Intelligence "co-operation" ; on b) the series on the Sweden-Saudi weaponry scandal ; on c) the training and participation of currently active Swedish journalists in the Military Intelligence apparatus. In these themes the ”Assange case” had emerged manifestly as a diverting manoeuvring from the part of the Swedish authorities, as I review in each of the articles which this series comprises. In this sense, I think it was sad that the long expected Uppdrag Granskning program [“Mission Investigation”] on the FRA/NSA whereabouts fallen short in some very important issues. One was not mentioning WikiLeaks’ Diplomatic Cables as the forerunner in the revelation about the Swedish collaboration with the US Intelligence and spying agencies (which unequivocally explains the “Assange case”, as a whole); the other it was that the program, apparently, failed to meet the highly important issue, announced by Greenwald himself, about exposing in the program the economic-espionage as one main component. I will develop this in a separate column. Meanwhile, I will publish here excerpts of the articles mentioned, that shown further episodes on the background in the Swedish collaboration with NSA and CIA which are not mentioned in the current Swedish media-debate. Please notice that I am referring to "Swedish collaboration towards the US", rather than "Swedish cooperation with US". In my personal view, all these agreements on the back of the Swedish people (and in fact many of those also known by Swedish Parliament members), do not serve the interests of Sweden; they are only to serve the interests of a foreign nation. With this said, of course I fully recognize the right if the US of protecting their own national interests. I have nothing against that (actually my position being that a real NEUTRAL Sweden would serve better the national interests of the US and of all countries in the world). However, the spectacular increase of the Swedish collaboration with NSA - although it might serve some Swedish industrial corporations - is definitely not serving the Swedish people, and it will sooner or later take all of us to stand a military confrontation with Russia. In this case, the best prognosis from the part of the Swedish Armed Forces Command is that we will able to stand one week. In fact, it will be unfortunately just a matter of hours, sad. "Cyber ​​warfare, if it is directed against vital infrastructure in another country, can certainly be tantamount to an armed attack. Naturally, we are not there now, but (this type of) hacking is not a triviality at all." ["Cyberkrigföring kan ju om, om den riktas mot vital infrastruktur i ett annat land, vara liktydigt med ett väpnat angrepp. Där är vi naturligtvis inte nu, men dataintrång är inte vilken trivialitet som helst"]. This article reviews a) Sweden's traditional culture among its rulers of spying on their own citizens - also a political culture of "Neutral" Sweden consisting of dealing in secrecy with (and on behalf of) NATO powers in matters of Intelligence; b) the allegations about a systematic cooperation between the Social Democratic Party and the country's Security Police, c) the juridical context of this illegal violation of the citizens' civil liberties and integrity - a context that has been characterised as "The Bodström Society", and the veritable threat to those abusing powers represented by WikiLeaks and its founder and forerunner Julian Assange. From that perspective, best way of keeping that threat as far away as possible, is to secure the arrest or seclusion of WikiLeaks’ sole and active forerunner Julian Assange as long as possible, and in "better" of cases, to keep him as incommunicado as possible. In the US, some top-ranking politicians and journalists have declared that the one and only optimum choice to solve "the problem" is to kill Assange. Just like that. In this political context, and nowhere else, a true explanation for the so-called "Sweden VS Assange" case - better named the "Sweden against WikiLeaks" case - is to be found. In 2008 the Swedish Parliament approved the infamous Surveillance legislation - an Intelligence-gathering instrument aimed at monitoring in detail and registering all electronic communications of Swedish individuals [See Debating Sweden’s surveillance legislation: The FRA-lagen VS civil liberties]. The ferocious – and unusual – struggle opposed by Human Rights activists together with the Swedish Pirate Party and some members of other political organizations was in vein. The government and its allies in Parliament motivated the new legislation on issues of Sweden’s national interest. 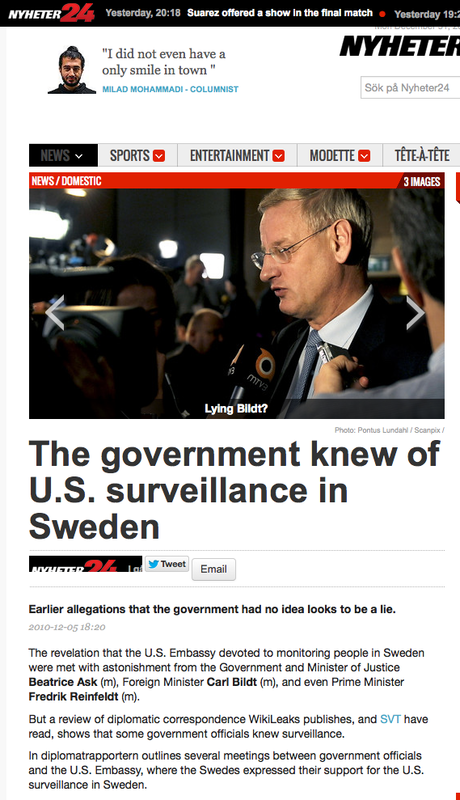 However, only two years later, the WikiLeaks cables gave evidence that the US government had ordered the Surveillance-law (FRA-lagen) directly to the Swedish rulers. In actual fact, the beneficiaries of such legislation that sacrificed Swedes’ civil rights and personal integrity all resulted from US-based entertainment companies to US Intelligence & enforcement agencies. Author Oscar Swartz had anticipated it all in “Marching towards the Bodström Society” (Marcshen mot Bodsträmsamhället). “Bodström Society” [Bodströmsamhället in Swedish] is a term coined by Swartz ca 2005, denoting an Orwellian-like development in the Swedish society that Swartz - and many with him - ascribes to regulation proposals or declarations by the reactionary former Minister of Justice Thomas Bodström (of the law-firm Bodström & Borgström). Bodström himself is ostensibly very proud of the epithet, and even adopted it as header for his blog he publishes from Virginia, U.S. (read 2011). 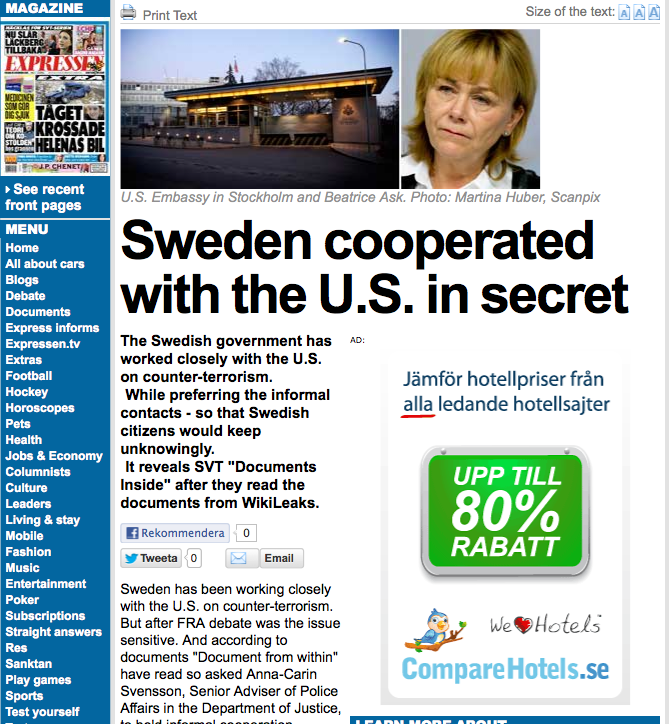 Almost concomitantly, other cables released by WikiLeaks exposed the secret agreements between high-ranking officials of the Swedish Ministry of Justice with CIA and FBI – with participation of the Swedish Foreign Office – with regard to the transference to the US of personal, political, and other private or sensitive information of Swedish citizens. 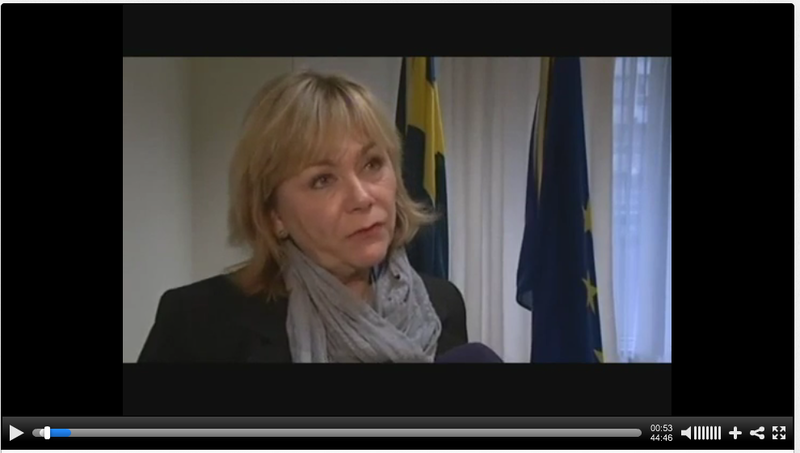 The agreements was – again – conducted on the back of the Swedish Parliament [See This is Why]. Historically seen, we find a veritable inquisitorial culture among autocratic Swedish authorities, particularly in regard the registering of the citizens’ leftist political opinions. Perhaps the most infamous (so far exposed) of such registers occurring prior the New Surveillance law of 2009 - was the “IB Register”. This was an Intelligence-gathering program kept by the Intelligence Services of Swedish Armed Forces. The revelations indicated, among others, that individuals with left-wing sympathies were systematically monitored and registered by the Swedish Armed Forces - in a period coinciding with the relatively strong public opposition to the Vietnam War. This surveillance and register of the leftist political opinions among populations was done “behind the back” of the Parliament t (See the IB affair). It was also exposed in this context that Swedish Military (the IB-bureau) ”co-operated extensively with the Central Intelligence Agency and Shin Bet of Israel“ (Wikipedia quote) and also that Sweden sent spies abroad. This was of course mentioned in severe contrast with the publicized international Swedish "Neutrality". At the time, the Swedish authorities responded to the IB-exposures with the arresting by the Swedish Security Police of whistle-blower Håkan Isacson (a former employee at the IB Office) and the authors of the disclosure, journalists Jan Gillou and Peter Bratt - and photographer Ove Holmqvist - in charges of espionage. They were sentenced to one-year in prison each. The allegations about a systematic cooperation between the Social Democratic Party and the country's Security Police. The issue of "SAPO" and "SÄPO"
During decades it has been discussed in Sweden the alleged relationships between the country's official Intelligence service (The Security Police) and an Intelligence service allegedly carried on by the Social Democratic Party. Besides the publications by Bratt & Gillou, an important research source on the subject is the book of Thomas Kanger and Jonas Gummeson “The Communists Hunters” (Kommunistjägarna, Ordfronts Förlag 1990). The all issue in was later taken up in connection to a special investigation ordered by the Swedish government. The document Rikets säkerhet och den personliga integriteten - Säkerhetstjänstkommissionens betänkande (SOU 2002:87) was finished on the 17 December 2002. Even the old discussion about the origin or background of the acronym-name used by Sweden's National Security Police is referred in the 160-pages document. In fact, the acronym used by the Social Democratic Party in Sweden is SAP (for Socialdemokratiska Arbetare Partiet), and the acronym used by the National Security Police is SÄPO (SÄkerhets POlisen = Security Police). Further, the acronym SAPO (without the "¨") it is said to refer to the Social Democratic Party's own Intelligence service. In a document I first found as an on-line publication of the Swedish Parliament (Statens offentliga utredningar SOU 2002:92) it is given that "SAPO" would stand for Socialdemokratiska ArbetsPlatsombudsOrganisationen [my capitalization]. Where the four words Socialdemokratiska = Social Democratic; Arbets = at/of the work ; Platsombud = person representing the Party, i.e. at a working place. The referred document is shatered in several places or some content deleted. There is however this seemingly extended - or at least readable version - in three parts, with the title "Det grå brödraskapet. En berättelse om IB" [found here] published on the base of the "Security Services Committee" Report of 2002. I emphasized "brödraskapet" (means brotherhood) because I found it peculiar, if not coincidental, that bröderskapsrörelse is the name of the social democratic organization that invited Julian Assange to Sweden in 2010 [See down below]. One most striking revelation was that the Social Democratic Party, that has been in the government of Sweden for decades, was originally pivotal in the architecture of the above mentioned IB-bureau (referred as "Group B" in the SOU 2002:87 document). For the IB Intelligence-gathering activity was also devised to espionage and register “communists” and other militants or left-wing sympathizers that the Social democrats would perceive as competitors in the so-called arbetarrörelsen (workers unions and similar organizations). The joint operation between the Armed Forces Intelligence and the Social Democratic Party had begun long ago in the 50’s with an agreement signed by the Minister of Defence Torsten Nilsson and the general secretary of the party Sven Andersson. The agreement was based in the fact that the Armed-Forces Intelligence would be using the listings kept by the social democrats (collected at the working places where the party had control of the unions). There were approximately 25,000 Chileans exiles in Sweden in the years after the military coup of Augusto Pinochet of 1973. 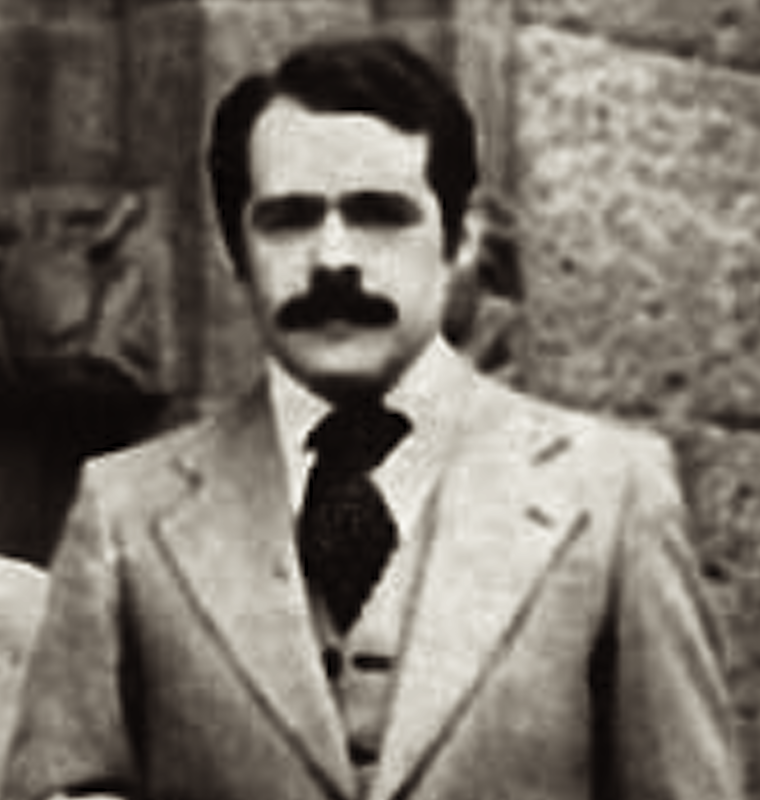 In the spring of 1977, Gösta Ohlsson, a member of the leadership of the Social Democratic Party (Partistyrelsen) and the official in charge of the Latin-American desk (or international relations) contacted Mario Espinoza (nom de guerre “Juancho”) – at that time a member of the Central Committee of the Movement of the Revolutionary Left (MIR), and in charge both of the MIR-Exterior Office in Sweden, and the "Junta de Coordinación Revolucionaria" [The Revolutionary Coordinating Junta, composed of the Chilean Revolutionary Left Movement (MIR), the Argentine People's Revolutionary Army (ERP), the Uruguayan Tupamaros, and the Bolivian National Liberation Army (ELN)]. The MIR-Exterior was the international bureau of the MIR, Movement of the Revolutionary Left, operating abroad to support activities of the anti-Pinochet Resistance led by MIR in Chile. During that time the military governments of Argentina, Brazil, Chile and Uruguay, had formed an operative terrorist alliance called the “Operación Condor” (Operation Condor, aimed a) To liquidate oppositional figures in exile – several bloody executions took place in different countries - and b) To counter arrest Resistance activities of the “Junta de Coordinación Revolucionaria” of South America’s Southern Cone, formed mainly by, MIR-Chile, ERP-Argentina, ELN-Bolivia, and the Tupamaros of Uruguay). Being the presence of MIR in Scandinavia the main among these organizations, MIR instituted in Sweden a counter-intelligence unit to fight Operación Condor activities in Scandinavia. I was designated to lead the unit. Mario Espinoza and I went to the meeting with the social democrats, which took place in Sveavägen 68. In the meeting, the senior party official, Mr Gösta Ohlsson, declared to us the following, as I recall it: “Our contacts in the Swedish Security Police informed that (Operation Condor) is to initiate activities for Northern Europe . . . from their current base in the Chilean Embassy in Madrid they may be sending more operatives here . . . We know also of the monitoring activities deployed in those regards by MIR . . . We therefore ask your organization to avoid any retaliating-action in Swedish territory, and also, for MIR’s own behalf, we ask you to synchronize your monitoring results with the one conducted on Operation Condor activities by the Swedish Security Police"
We wondered how it was that social democrats knew about our monitoring of the Junta agents and presumably operatives of Operation Condor. After all we worked with tight clandestine routines, encrypted communications, etc. ; all members of my unit – and we were only few - were former combatants with long experience in undercover work and also survivors of Pinochet harsh prisoners camps (Quiriquina Island, Chacabuco, and Concepción). It was no task for “civilian” social democrats - or for that part not a possibility for any civil organization – that with normal means they would be able to get insight about our operations. The most credible, we reasoned from the beginning, is that the information was passed to the social democrats after a professional surveillance – technically superior – done by the Swedish Security Police. But again, how come it was the Social Democratic central bureau that contacted us? Why the high-ranking party official at 68 Sveavägen st. said explicitly “Our contacts in the Swedish Security Police informed . . .” ? Further, the Social Democratic Party it was not at that time in charge of the Government, it was not an “official” party – why they would enjoy official contacts with an official institution such as the National Security Police? Some answers became clearer while doing the talks on behalf of my unit at the Security Police headquarters at the Kungsholmen compound. It is not that solely judging after the contact-episode above I would be in position to prove that some kind of communication pipes between the Security Police and the Social Democratic Party did exist systematically. Yet, my strong impression was - after the conferences and several walks I had together with the gentlemanly senior official of the Security Police in the nearby park - that this was the case. That they did cooperate. [in the picture at right, the author standing outside the Court & Police building in Kungsholmen, Stockholm, 1977. Zoomed photo taken by one member of the UCI (our operative unit) and film developed in our artesian lab]. The contacts lasted for about two months, until the situation was declared under control. Operación Condor in Scandinavia was namely neutralized and no political exile figure was killed in spite of the over 30,000 exiles from the corresponding Operation Condor countries living there at the time. However several assassinations occurred elsewhere. During these activities I met several Swedish Security Police officers – outstanding professionals - including two senior-ranking officers. Incidentally one senior officer presented me fortuitously to Prime Minister Thorbjörn Fälldin, while he was at the Security Police headquarters using a "sport facility" located in the building - I omit saying where. I will not give here more details, or names, etc. In 2003, the CIA sent a new station manager to Stockholm. He would have been who, during a meeting in the Cabinet Office, put forward the stricter requirements for enhanced cooperation declared in the reportage. The requirements were met at the Ministry of Justice, which has the tuition for all police activities including the Secret Police or Security Police. And who was Minister of Justice in 2003? The very same social democrat politician Thomas Bodström. In fact, those “informal” agreements have placed the Swedish security and military intelligence so heavily under the control and command of the Americans, that, as reported by Ölander, referring to the years ensuing 2003, Sweden officials got the impression that they were working under direct orders of the CIA [“Under de kommande åren förändrades svensk underrättelse-och säkerhetstjänst på ett sådant sätt att enskilda tjänstemän uppfattade det som att de arbetade på direkt beställning av CIA”]. 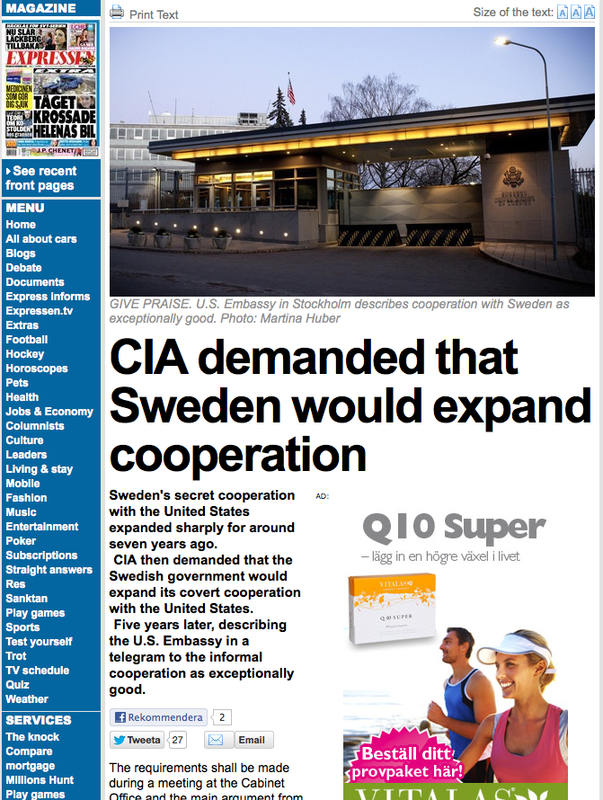 "CIA has taken such liberties and carried out operations in Sweden and has gone so far that in SAPO had high-level meetings to discuss what you can do to get them to calm down"
And this is the context truly explaining the shameful episode in which Sweden delivered in secret one night at Bromma Airport, in the heart of Stockholm, the political prisoners to CIA operatives fir further transport in US aeroplane to Egypt – to be interrogated under torture. And this was done with the direct participation of the Ministry of Justice. At the time the Minister of Justice was Thomas Bodström; he was signalled in an Aftonbladet article by Margareta Zetterström, a close friend and working colleague of the late Foreign Minister Anna Lindh, as a central gestalt in the referred rendition-flights operation. 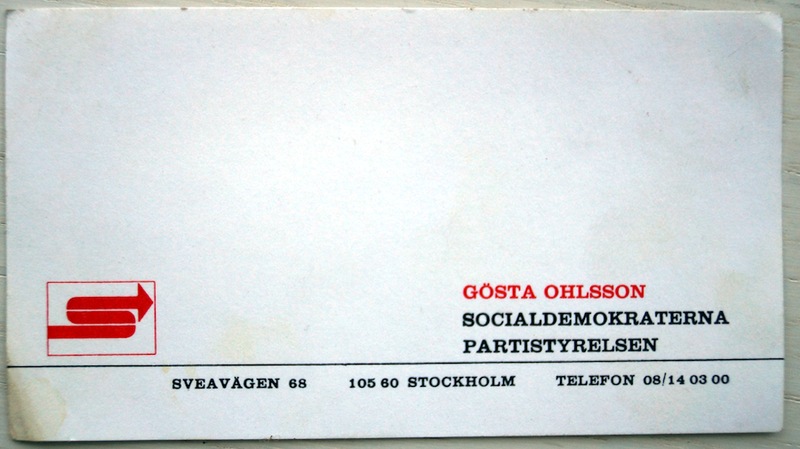 In the context above denoting such pervasive and ubiquitous collaboration between the social democrats with both the National Police and the CIA, it is not at all strange that a hypotheses on a “CIA connection” and a “Police connection” linked to the social-democratic organization Bröderskaprörelsen flourished – as they did in the early explanations of the “case” of Sweden against the WikiLeaks founder. “Bröderskaprörelsen” is an intern religious circle within the Social Democratic Party. The current (Swedish) Wikipedia article refers to this organization as “Religiös sidoorganisation till Sveriges socialdemokratiska arbetareparti”. Both Göran Persson, Thomas Bodström and one of the Assange nominal accusers are prominent political figures in this clique. This woman – AA – was at the time of the “accusations” nothing less than the Political Secretary of the said social-democratic organization Bröderskapsrörelsen – now after the exposures renamed “Tro & solidaritet“. Further, this was the organization that invited Assange to lecture in Sweden. The rest of the set-up is well known. It is worth noting that political officials representing political parties in the government of Sweden do make all these geopolitical-sensitive decisions. Such decisions – unlike in other countries – are not taken by or at the initiative of officials at the Security Police. They are only to implement decisions coming from the government or respective ministries. It is also known that the Swedish Security Police has indicated the need for an actualization of the Swedish legislation dealing with illicit espionage activities by foreign agents operating in Swedish territory. Further, according to SÄPO, "foreign intelligence gatherers in Sweden are today less interested in military bases or airfields and more turned to political or research espionage" (source: "Sweden's spy laws need updating: Säpo", The Local, 24 of May 2011). Moreover, it is known that in some occasions (and there might be also - for the public - unknown episodes) the Swedish Security Police have acted more independently from their American counterparts, or have pursued obtaining further or explicit directives from the government authorities. That was the case in the Egyptians episode when a top chief of the Security Police insisted in having a clearance from the Ministry of Justice. For in the Swedish praxis these authorities are mainly the Ministry of Justice and the Foreign Office, apart of the Central Government Office (Regeringskansliet). The Head of the "America Section" at the Central Government Office, Maria Lundqvist (photo at right), was apparently one of the first high-ranking officials that met the delegation representing the US government and US Intelligence establishment. 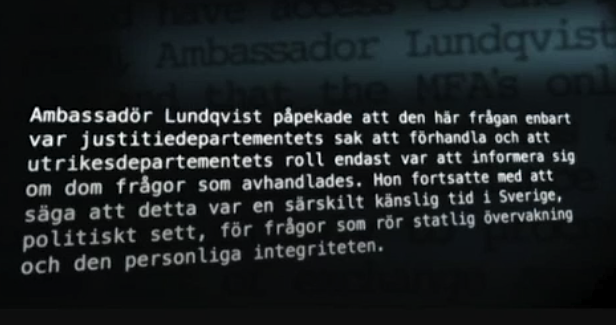 According to the evidence reviewed in the documentary at SvT "De hemliga telegrammen" [See down bellow], Ambassador Lundqvist warned the American delegation about Sweden having at the moment a "sensitive time", politically speaking, regarding issues of Government surveillance and of personal integrity. She made also clear that the matter (the collaboration with the US on Intelligence gathering of Swedish citizens) was "an issue to be negotiated only with the Ministry of Justice. The role of the Foreign Office was only to get informed on what the matter is about". - That is done in the frame of existing legislation and regulations, and they are generally known (in Parliament). But what Bildt is referring to with “they are widely known in the Parliament” is the “existing legislation and regulations”. In his concrete answer Bildt is in fact confirming that the collaboration as such, or what the different collaboration agreements in concrete are about, is kept secret from the Parliament. And this is against the law; it is unconstitutional. 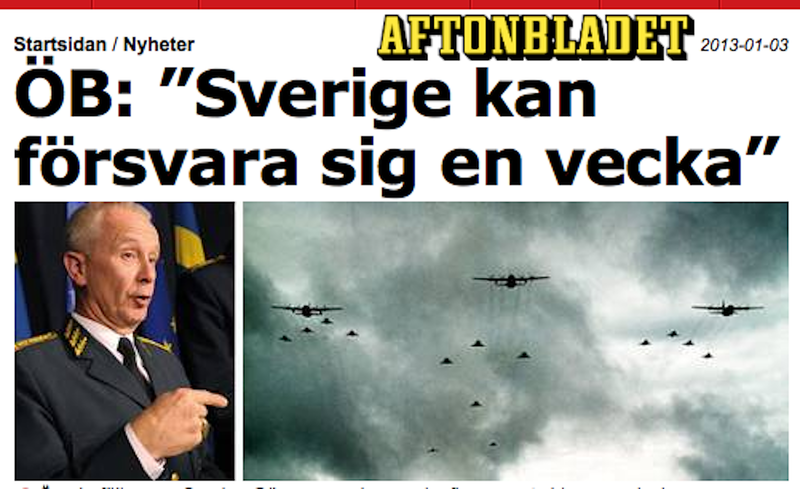 My conclusion is that Carld Bildt is bluntly lying on this issue. And he is not the only minister doing so in the Reinfeldt government. And that was equally the praxis referring the collaboration-issue under the (for Sweden’s truly national interests) catastrophe government of the confessed pro-Bush admirer Göran Persson – and of his Justice Minister Thomas Bodström. The Swedish Police, including the Security Police, are under the Ministry of Justice. The documentary clearly shows that a high-rank official at the Ministry of Justice, Anna-Carin Svensson (in charge at the Ministry of Police matters) asked the Americans to better keep the “cooperation” informal. This, as we said above, on the occasion that the US wished a formal, legal agreement, with their Swedish counterparts on matters of Intelligence cooperation. However, the Minister of Justice Beatrice Asks – as her colleague Carl Bildt has done towards the press - denied bluntly in the referred documentary any knowledge of any “secret agreement” performed with the Americans by her Ministry. This, spite of the fact that the reporter confronted her with the leaked evidence. Minister Asks declined to comment. It is a most revealing documentary and a good piece of journalism. I wished I had the possibility to insert English texts in it! 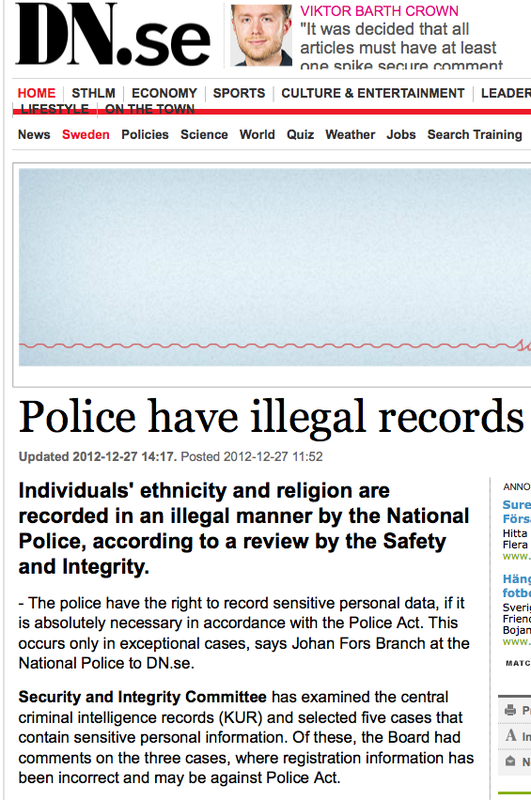 While I am writing this article – previously announced in the Introduction of my series Sweden VS Assange – Insider Analyses – I read in Dagens Nyheter (DN) of today 27 December that “Individuals' ethnicity and religion are recorded illegally by the Swedish National Police” [Enskilda personers etnicitet och religion registreras på ett olagligt sätt av Rikspolisstyrelsen]. That is the conclusion reached by the Swedish Commission on Security and Integrity Protection whose spokesperson refers further investigation on the issue. 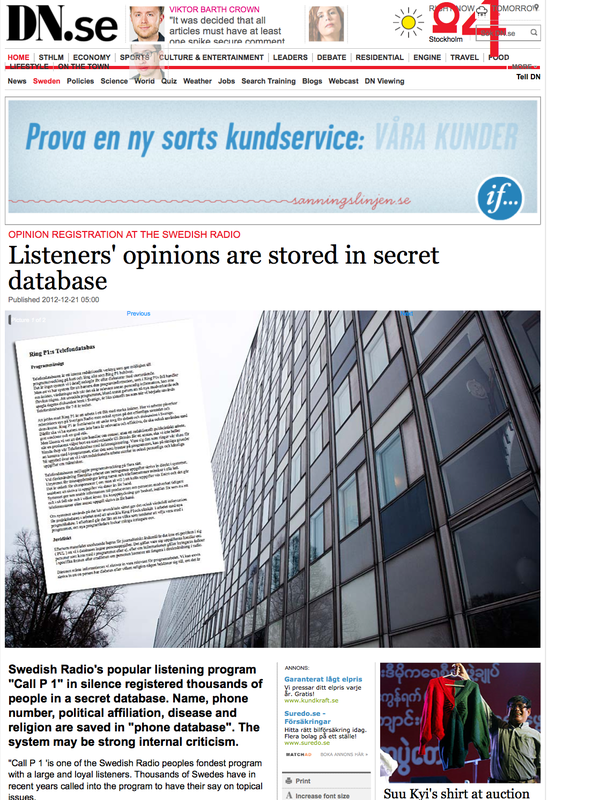 And just a week ago it was disclosed that the State-owned Swedish Radio register the political affiliation or political sympathies of Swedish listeners participating in the call-in program Ring P1! Now that Julian Assange has announced a massive release of information that would affect "every country", Sweden's rulers can with all right feel uncomfortable. But there is one certain way to impede or greatly obstruct the “disrupting” disclosures done or to be done by WikiLeaks. Defend Julian Assange’s Human Rights. Defend his right to live and let us secure WikiLeaks enormous contribution to free information on behalf of true democracy. "I Julian Assanges biografi från förra året beskriver han Wikileaks med ett begrepp som har gnagt sig fast i mitt minne: folkets underrättelsetjänst. Organisationen, menar han, ska avslöja maktmissbruk och korruption i världens härskarskikt. Sådant som folket förjänar att veta.Det är en vacker tanke. De flesta journalister vill nog vara en del av folkets underrättelsetjänst. Men begreppet pekar också på det obehagliga glappet mellan medborgarna och det hemlighetsfulla underrättelseväsende som verkar i våra namn. Om inte FRA, MUST och Säpo är folkets underrättelsetjänster, vems är de då? Regeringens? Carl Bildts? Främmande makts?" M Ferrada de Noli, Swedish/U.S. Intelligence co-operation in the Bodström Society. Part IV of the series “Sweden VS Assange” – Insider Analyses. Professors blogg, 28 Dec 2012. M Ferrada de Noli, Sweden's FOI publicly slandering WikiLeaks while in secret help building missile factory for Saudi Arabia dictatorship. Professors blogg, 6 March 2012. / Sweden-Saudi arms factory scandal: "Arms Export Control" Authority participated in the secret negotiations. Called by Defence Minister. 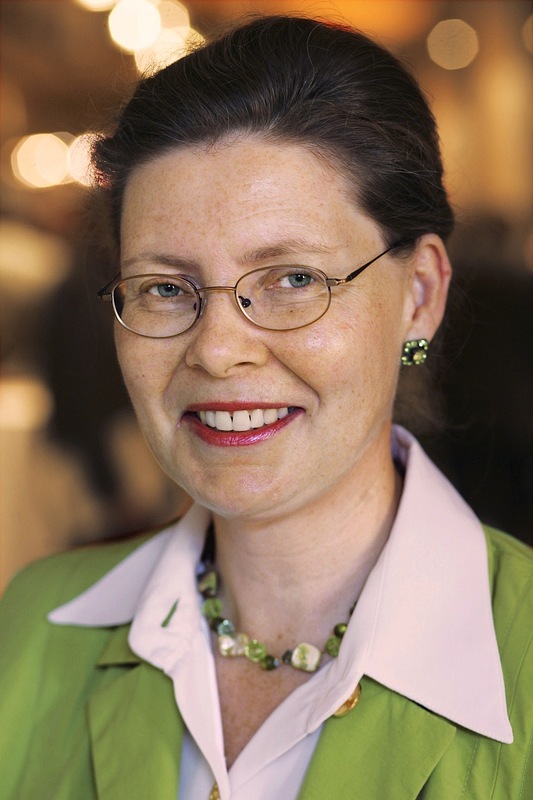 Professors blogg, 7 March 2012.